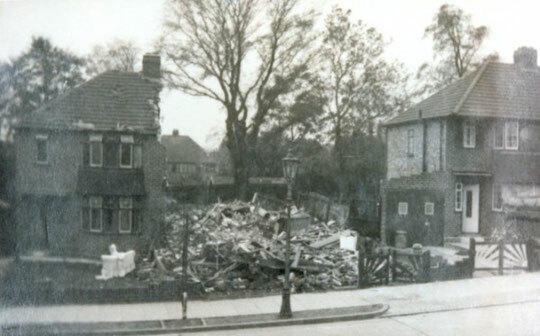 I lived at 50 Florence Road, Acocks Green, and we had one of the first air raids in Birmingham. 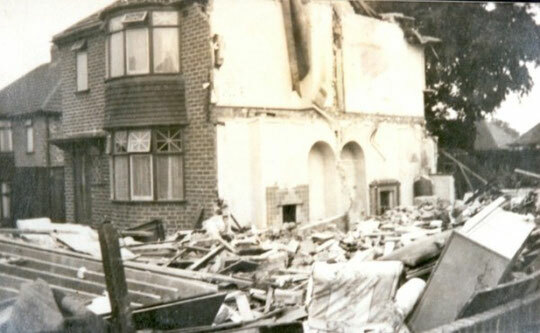 Bombs came across Francis, Florence and Cottesbrook Roads. They might have been after the Rover shadow factory, and mistaken the three rows of terraces for factory blocks. Two people died in Cottesbrook Road. We were in our Anderson shelter. The roof of our house was damaged. Shrapnel and bricks from the house across the road came through it and made a hole three or four yards across, and my bed was covered with debris. The raid was seen as a novelty by many at the time. The roads were roped off, and only people who lived there were allowed through until the damage had been repaired. In fact, people came on the Outer Circle bus to stare from the end of the road. In 1940 my Mother was at home with us four children at 12 Wildfell Road, Acocks Green. She was expecting our Father home on leave from the army. Apparently she received a telegram saying that he wouldn't be home that night so she decided to take us to her sister's house. My sister and I were put into the pram and the two boys walked either side through the park to 105 Gospel Farm Road. During the night/early morning there was an air raid and we all went into the air raid shelter. There was a loud bang and my Mother said: "It's my house! My bloody house”. My Uncle came home from ARP duty and said that everything was ok and they managed to pacify her. The next morning she took us all back and on the way passed the milkman who said: “It's your house that was hit”. The boys laughed thinking it was a joke. As we approached Pool Farm Road it was cordoned off and the Police stopped us going through. My Mother said: “that's my house”, she was asked for her name and when she said “Mrs Evans” was told: “Hurry up Mrs, they're digging for your bodies”. The family next door named Prince had lost 4 members of their family, the Mother, Father and 2 children. Their shelter was built near the house as Mr Prince didn't want to spoil their garden by building it at the bottom of the garden like most people. We had had a lucky escape. We stayed at my aunt’s house and were eventually re-housed at 100 Gospel Lane where we spent the rest of our childhood. We lived in Wildfell Road right opposite the houses that were demolished killing 4 out of a family of 6 (1940 I believe). They were such a nice family, in fact only a few weeks before that fateful night Mr and Mrs Prince had been over to our house, which was the old tradition when most people had a piano and invited neighbours in to have a sing-a-long. (Such comradeship during such troubled times). Mrs Prince had a lovely voice and always sang a solo. The particular night I remember she sang, “Down in the forest something stirred” (not sure of the title of it). Mr and Mrs Prince, their middle daughter, Sylvia, and their middle son, Norman, were killed but fortunately the rescue services managed to save the eldest daughter Joan and the youngest son Selwyn. We were very lucky, as the blast did not even crack our windows although it did kill our budgie. It died of shock, we presume. What a terrible night that will never be forgotten. 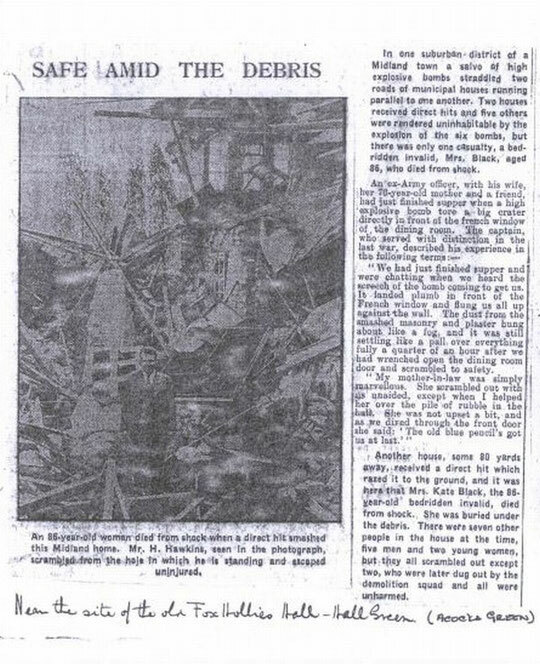 Birmingham Mail, 13th September 1940: bombing of Shaftmoor Lane and Fox Hollies Hall area. The old lady, Kate Black, was killed at 60 Allcroft Road, Hall Green. ...all the water was cut off, and the only place we could get water was the Hazelwood nurseries. They had an everlasting well, and we all had to go down with buckets, jugs, pails, and everything, and all round this district had to go to Hazelwood Nurseries for water. It was for weeks...we did manage to fill our bath upstairs with water, but we daren't wash our hands, because it was too precious. The water was only for using for eating and drinking. 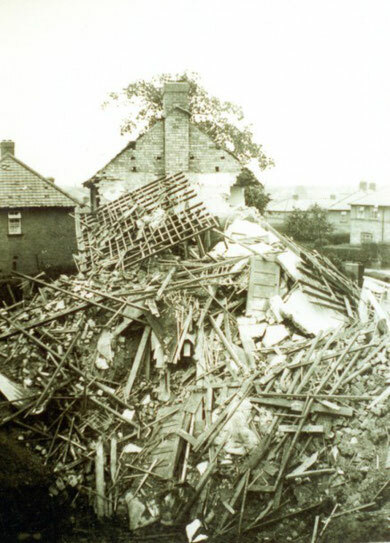 Fortunately, although we stand high, and Hazelwood Road is lower than us, we used to leave our doors and windows open to the elements, and we felt (the blast) blow right through the house, up the garden, right to our shelter, and we had a dog in those days, Bob, and he was blown out of the house, up the garden, right to our shelter, and he was unhurt, and our house never had anything the matter with it, and yet people either side lost their windows, but I used to say: "leave all the doors open". Of course, it was very, very cold, but I didn't mind that, because I was in the Civil defence at the time, and they said: "leave the doors and windows open, and it will be better for you", and it was. I joined the Air Training Corps at 15...I served quite a large part of my earlier and younger days on bomb damage - war damage. Oh, dreadful days, days which I hope boys and girls today will never see again, because I well remember going down and standing in a queue, to have water pumped out of the canal, by the Speedwell pub, in Acocks Green. Two buckets per person, for washing, shaving, and boiling for drinking purposes. Gas mains being blown up. People - bits and pieces of people being blown about....Houses wrecked, fires...All this on top of a day's work. You come home at about 7 o'clock from work, go straight down the shelter, have a meal, come out of the shelter in the morning, have a wash, change and go back to work, come home and the same thing again next night. We were very glad of a respite, when they didn't come over, believe me. I well recall, coming back from acting as a runner for the A.R.P. : one of our neighbours was the A.R.P. section leader. he had the stirrup pumps, buckets, and everything which were usually stored in the entry, and I was sent down at the commencement of the raid to the Headquarters at the cemetery...just to report that we were on standby and ready. The sirens had hardly gone, and I had got by the Ivanhoe Nursing Home, facing Augusta Road, and I was promptly blown over the wall by a bomb which dropped on the corner and blew the lamp post down. luckily, it was a small bomb, otherwise I might have got blown over the whole nursing home. but, picking myself up, having a ringing in my ears, and looking across the road at the small hole, I suppose I looked on it, I suppose I was a bit lucky there. The sirens had hardly gone, so someone was a bit late with them that night. Some nights they never used to go at all, and we still got a bomb in before they decided to blow the sirens off and get them going. Nevertheless, they were good times. People were very friendly and all neighbourly. A thing which was common in Acocks Green in those days, funnily enough...and people in situations when they were in tight corners. but alas, it's not there today. See our pages on the church for information on this. See our pages on the school for information on this. The only thing that was left of the house up the road there was a bathroom on a lead pipe: there was a lead pipe going up and a bath. All the rest had gone. Yes, I can remember that quite well. And funnily enough, talking about that, the gentleman that lives next door to that house decided to have his drive done, and they had a lot of trouble with it. A bomb had gone in and under, but it hadn’t gone off. They had to get the bomb disposal squad in. The bomb had been there since the war, and nobody knew. The peculiar part about it is, we’ve been in our air raid shelter down here and we’ve heard the bombs go over the top…shshshshshshsh…we’ve ducked, ready for them to go off, but we haven’t heard them explode. Goodness knows where they are now, they’re probably still about somewhere. It’s almost impossible, isn’t it, to find every bomb that was dropped during the war. There were lots of raids, oh yes, well we had some bombs in this road. We had one opposite, in the house opposite. He never saw his greenhouse or his apple tree any more. We had one in our road, and I really thought I had bought it. it blew our front door open, it blew me up the hall. I was very cross about that. Woosh. Just opened the front door....I went up the hall...slammed into the kitchen. The next second the kitchen window went, and of course (I was) then frantically dashing for blackouts. Three houses were hit on Eastcote Road. The middle one was destroyed, and all that was left was the downstairs bath, with a few housebricks in it. Amazingly, the bath was not broken. Afterwards, we used to come back through this way as a shortcut coming back home. One night in July 1942 the sirens must have sounded. The first thing I remember was standing by the fireplace in front of Mum, who was dressing me in warm clothes. Barry was already in the cupboard and Dad was standing there in full uniform, including his great-coat and steel helmet. Our parents were suddenly alerted to the sound of falling bomb, said to sound like express steam trains coming through the air. In an instant I was placed under the sturdy dining table with my Mum there beside me. As I looked up I saw Dad flatten his back and the palms of his hands against the wall, tilting his head forward and bracing himself for the impact. The raid of 22nd/23rd November 1940, among much other destruction, fractured three large water mains on the Bristol Road, and 60% of the city was without water, mainly on the eastern side. Those fighting fires had to use the canals, or water in bomb craters. If the bombers had returned the next night, Birmingham would have burned, but they did not. Although extra water mains had been put in before the war, obviously more water was needed. By the beginning of 1942, huge water tanks had been built all over the city, and in Acocks Green there was one where the Little Theatre is now, by the Fox Hollies Road towers. The volunteers who built the Little Theatre had to demolish the tank themselves before they could build anything. If we didn't have water, we had to wait in the queue to get it from the tank at Fox Hollies. I had to go about three times. One day I took the tin bath on the pram, stood in the queue, got it filled, and walked all the way down Pemberley Road, past Eastcote Road, and to Ryde Grove. Suddenly a police car came behind me. The police used to chase us a lot for scrumping on Colonel Walker's land, so I got out of the way quickly, and spilled all the water. One night Dad was standing at the back door watching the planes go over when suddenly a bomb dropped not too far away. The blast took him off his feet and he landed under the kitchen table. Fortunately he wasn't hurt. On another night we were in the shelter during an air raid when we heard a bomb drop close by. The air raid warden came to the shelter to see if we were all OK. When told we were he went away without further comment. After the all clear sounded we emerged from the shelter to find we only had half a house standing. The bomb had hit the roof at an angle and gone through the front of the house. it was a terrible shock for a six year old.